The Town of Artesian Council met on December 7, 2016 in regular session at the Artesian Community Center. Council Member Effling called the meeting to order with Council Members Danek and Richard, T. Fridley and Finance Officer G. Effling present. Lagoon: Waiting for the arrival of the replacement pump for the lift station. Garbage/Sewer: Discussion on proper garbage receptacles and location of receptacles. Only burnable items may go to the city dump – no tires, lawn mowers, finished wood siding, etc. Streets: In good condition for winter. Discussion on burning vacated structures. Discussion on city insurance coverage. Discussion on joining the Municipality League. Motion was made by Danek, seconded by Richard. New Business: Discussion on the Workmans Comp Insurance Policy and need a current listing of members of the Artesian Volunteer Fire Department. Discussion on smoking of the sewer system. The next meeting will be January 4, 2016 at 7:30 p.m. at the Artesian Community Center. There being no further business brought before the Council, motion by Danek, seconded by Richard, meeting adjourned. Motion carried. The School Board of Sanborn Central School District 55-5 met in regular session on Monday, December 12, 2016 at 7:00 p.m. in the Sanborn Central Conference Room with the following present: Curtis Adams, Clayton Dean, Justin Enfield, Troy Olson & Brenda Schmit. Others present were Superindentent Siemsen, Elementary/Middle School Principal Vermeulen, and Business Manager Bechen. Motion by Dean, seconded by Enfield, all aye, to approve the agenda as printed. Motion by Adams, seconded by Schmit, all aye, to approve the minutes of the regular board meeting November 14, 2016 as printed. Visitors to Board Meeting. Paula Sanderson, teacher representative, and Brett and Kelly Selland. Motion by Enfield, seconded by Adams, all aye, to approve the Financial Statement and bills. Discussion was held. General Fund balance, November 1, 2016: $43,604.22. Receipts: taxes $325,341.65, penalties/interest $745.93, interest $8.03, other pupil $69.94, other income $105.34, state fines $2,487.93, state aid $60,668.00, admission $45.00, Medicaid $600.33. Expenditures: $170,313.23, manual journal entry $89.49. Balance, November 30, 2016: $263,273.65. CorTrust Savings balance, November 1, 2016: $149,820.67. Receipts: interest $0.00. Expenditures: $0.00. Balance, November 30, 2016: $149,820.67. Capital Outlay Fund balance, November 1, 2016: $1,049,938.69. Receipts: taxes $161,970.14, penalties/interest $356.56, interest $40.65. Expenditures: $9,644.01. Balance, November 30, 2016: $1,202,662.03. Special Education Fund balance, November 1, 2016: $116,744.43. Receipts: taxes $6,618.46, penalties/interest $44.34, interest $3.74, Medicaid $50.00. Expenditures: $20,530.15. Balance, November 30, 2016: $102,930.82. CorTrust Savings balance, November 1, 2016: $1,824.14. Receipts: interest $0.00. Balance, November 30, 2016: $1,824.14. Pension Fund balance, November 1, 2016: $3,069.57. Receipts: taxes $24,186.04, penalties/interest $44.34, interest $1.07. Expenditures: $0.00. Balance, November 30, 2016: $27,301.02. Food Service Fund balance, November 1, 2016: $(21,959.78). Receipts: student lunches $6,635.56, adult lunches $548.91, ala carte $5.10, lunch certification $162.54, federal reimbursement $4,733.82. Expenditures: $13,620.61, manual journal entry $54.00. Balance, November 30, 2016: $(23,548.46). Enterprise Fund balance, November 1, 2016: $(1,497.93). Receipts: $0.00. Expenditures: $0.00. Balance, November 30, 2016: $(1,497.93). Scholarship Fund balance, November 1, 2016: $13,676.67. Receipts: interest $0.52. Expenditures: $0.00. Balance November 30, 2016: $13,677.19. Peters Scholarship balance: $13,677.19; Nelson Scholarship balance: $0.00. Trust and Agency Funds balance, November 1, 2016: $53,032.78. Receipts: $29,928.60. Expenditures: $8,372.63, manual journal entry ck purchase $190.00. Balance, November 30, 2016: $74,398.75. Jaymar Business Forms, w-2/1099 $48.50; K&D Busing, half co-curricular busing $851.66; Kormanagement Services, drug testing $432.00; Menards, janitor supply $41.34; Mid-Dakota Technologies, November tech support $125.00; Miner County Pioneer, renew periodical $49.36; Petty Cash, postage $39.27; Pioneer Drama, scripts $35.50, royalty fee 50.00; Runnings, ag supply $17.38; Sanborn Weekly Journal, board proceedings $72.67; Santel Communications, telephone/internet $240.85, professional service $287.50; Scrantron Corporation, achievement series $299.60; SDHSAA, extra volleyball medals $17.00; SDFBCA, football clinic fee $50.00; Sun Gold Sports, declam ribbons $25.00; Tessiers, janitor supply $296.16; VISA, gas $51.45, quia subscription $49.00; Walmart, high school computer supply return $10.00, Wessington Springs School, one-third football salary/benefits coaches $4,137.74; Wheelco, bus supply $125.98; Williams Musical & Office, tune piano $90.00. CAPITAL OUTLAY Fund — A&B Business, copier lease two month $1,672.00; First National Bank in Sioux Falls, agent fee $600.00, co cert interest $5,747.50, co cert prin $135,000.00; Schmit Ag, Inc., 10’ box scraper $1,100.00; Wessington Springs School, one-third football equipment $1,103.92. SPECIAL EDUCATION Fund – James Valley Education Coop, psych $1,802.00, pt $2,571.00, OT $3,445.00, administrative service $4,107.00; Petty Cash, postage $3.83; Ramkota, workshop room $57.00; Paula Sanderson, meals $37.00. FOOD SERVICE Fund – Card Services, food $94.35, supply $13.80; Cedar Shore Resort, workshop room $94.95; County Fair, food $13.34, supply $7.38; Darrington Water, SS tank $24.00; Dean Foods, milk $642.54; Earthgrains, bread $138.32; Reinhart Foodservice, food $3,190.45, supply $105.68; Walmart, food $19.68. • Christmas Break December 21st at 11:00 a.m. through January 2nd. • Colony Christmas concert on December 14th at 7:30 p.m.
Motion by Schmit, seconded by Adams, all aye, to approve the name change from Artesian School to Sanborn Central School and assign Superintendent Justin Siemsen as an authorized user, along with Gayle Bechen, to the safe deposit box at CorTrust Bank, Corn Palance Branch in Mitchell. Motion by Dean, seconded by Adams, all aye, to approve an executive session SDCL 1-25-2(1) to discuss personnel with possible motions to follow at 7:27 p.m. Regular session resumed at 8:59 p.m. Regular Board meeting will be held on Monday, January 9, 2017 at 7:00 p.m. in the Sanborn Central School Conference Room. Motion by Dean, seconded by Adams, all aye, to adjourn the meeting at 9:00 p.m. 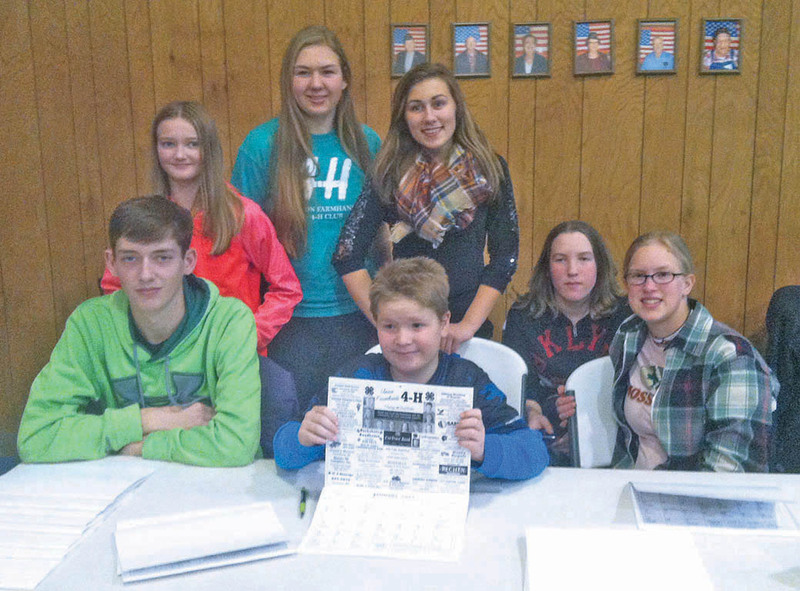 The Union Farmhands met Wednesday, Dec. 21, at the Artesian Community Center. Members present were Sawyer and Aubrey Senska, Katie Schmit, Amber, Dana and Alex Schelske and Catherine Bechen. 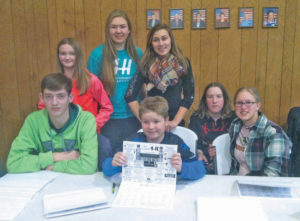 The members sold the annual Union Farmhands community calendars at the CIA ham drawing. Calendars can still be purchased from any of the Union Farmhand members.